These shrouds are identical to those for the PT31 torch. 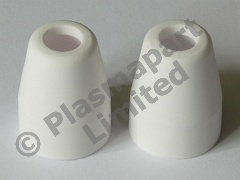 PT 31 XT shrouds suitable for use with the PT 31 XT torch, which is used on many Chinese plasma cutters. These parts are excellent quality and are manufactured to extremely fine tolerances - the shrouds are manufactured from solid-state sintered, fully stabilised, Zirconia-Yttria ceramic. This pack is supplied as shown, and contains 2 Shrouds. Model 18204.